Why would your rent when you can buy for less? As I was deciding what to write about a few things crossed my mind, like Tax-Free Week. But then I started wondering, why do people bother with the hassle of renting dresses, when they can buy and own them for almost the same price? RentTheRunway: the website where you rent an item of clothing or accessory for 4-7 days, and then return it. I can think of one reason to use this site – you live in a studio apartment in the City and don’t have a closet. If you don’t fit that description – then I would definitely steer clear of RentTheRunway. While I’ve never actually rented from the RentTheRunway (and never will), I have browsed it quite a few time. While I understand the concept, I just don’t understand why anyone would use this site to rent clothes for four days when they can own the same exact product. Maybe you’re thinking, “Some of these are $1,000+ dresses that I can’t afford.” Well, yeah there are some $1,000 dresses (original price!). But they are also most likely on sale at Saks, Bloomingdales or Neiman for just slightly higher, the same or even lower than the rental price. 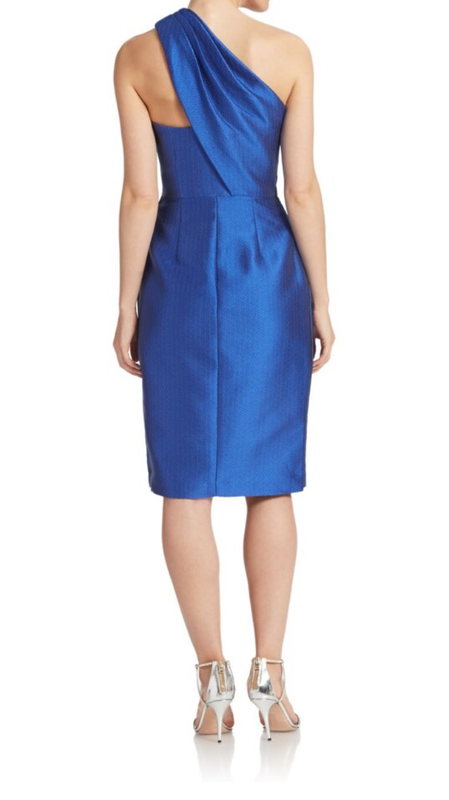 A gorgeous cobalt blue ML Monique Lhuillier sheath which originally retailed for $398 can be rented on RentTheRunway for $75 (4 day rental) or $120 (8 day rental). The dress is actually selling for $398 at Bloomingdales. The same exact dress is currently on sale at Lord&Taylor for $298.50, free shipping, free returns, plus an additional 20% off with code SUMMER, bringing it to $238. But, that’s not cheap enough. Keep looking. 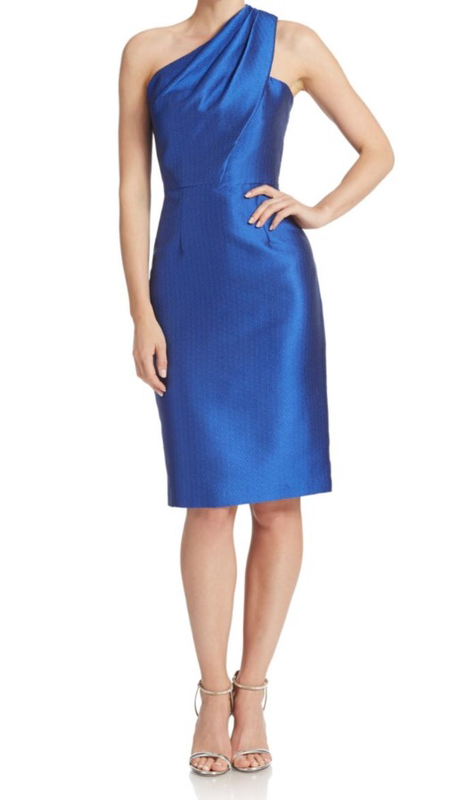 Guess what, the same exact dress is on sale at Saks Fifth Avenue (online) for $148.06, free shipping, free returns – almost every size is still available too. If you sign up for e-mails you get an additional 10% off bringing it to $133.26 to OWN – plus if you shop with your discover credit card through Saks on shop discover, you’ll get an additional 10% cashback bonus toward your credit statement. So if you’re doing the 8 day rental, wouldn’t you rather own this dress, for only $13 more! Don’t need it right away? Wait until Saks has an additional 25% or 30% off their sale items, it’ll be even CHEAPER than renting for 8 days. Saks wins again. 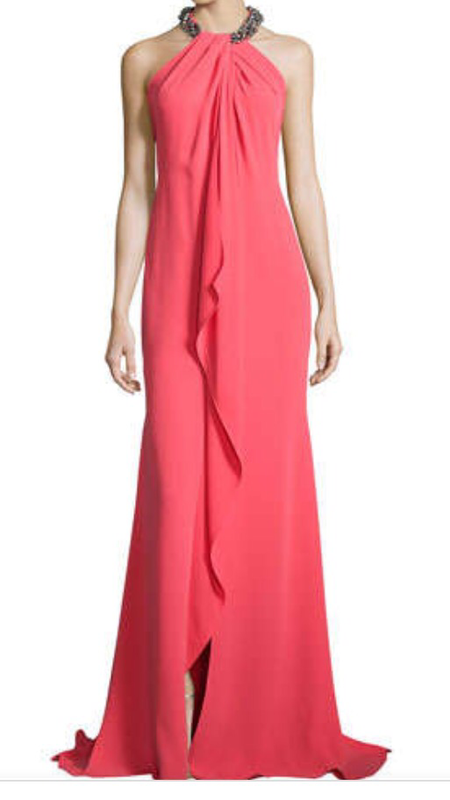 Same exact dress = $266 to own in either the coral color or royal blue. Use that 10% coupon from signing up for e-mail bringing it to $239.40 and it’s CHEAPER than renting for 8 days. Normally, when I buy a dress or jumpsuit I need it altered in some way to fit perfectly: taken in through the waist, shortened, or taken up in the shoulders. Unless you are 6′ tall or going to wear 4″ heals, don’t count on a maxi dress, ball gown or jumpsuit from RentTheRunway fitting you. And since you don’t own the item – you can’t alter it anyway. Plus, who wants to deal with making sure the mailman delivers it on time and making sure it gets back to the company by your deadline! If you don’t even see it until the day you wear it, or one day before how do you know what shoes & accessories work well? At least if you buy a dress from a department store and it doesn’t fit, or if you don’t end up wearing it, you can simply return it for a refund. If that dress you rented doesn’t fit you, or if you end up not wearing it, you’ve lost your expensive rental fee! Next time you consider renting – take the time to check a few websites and find it on sale – for cheaper than the renal fee. Only end up wearing the designer dress once? Bring it to an upscale consignment shop (such as Second Time Around) or sell it on e-bay or Tradesy. You’ll most likely be able to sell it for the sale price that you paid.